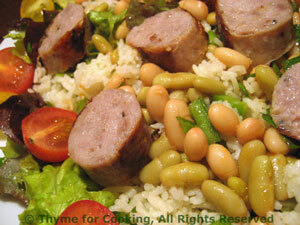 Salad with Grilled Sausages, Basmati Rice, Thyme for Cooking recipes. I use both white beans and the small, green flageolet that we find easily here in France. I can buy them both in 8oz cans so it's easy to combine them for color and variety. If you only have access to the 15oz cans, use all of one type, white, green or red.